My roots in this country run deep. Four hundred years deep. My ancestors founded settlements which are national historic sites. My great grandfather built the roads where I grew up, and where roads have never been seen, his fathers once ventured, through the bush and across the lakes. It’s no surprise that my affinities are for the Boreal north, and the folk living there, rather than the cosmopolitan malaise of Terroronto or Shangcouver. By the time I was born the demographic transition of our urban cores was well underway. I can only imagine what changes those of you in older generations must have witnessed as Canada turned from a European country into whatever this diverse, flaccid, liberal utopia is supposed to be. There are many Canadians with roots as deep, but how many care to remember them? Today’s lack of historical awareness, like the ethnic confusion on our streets and in our polity, is a lesson in past political failures and the wayward trajectory of our national consciousness. What words could stir white Canadians toward self-preservation in the face of displacement and erasure? It would seem that Canada loves the current artificially created harmony too much, and will accept a great deal of misfortune before upsetting it with anything so rude as self-interest. The common refrain in American media is that Canadians are over-polite and enthusiastically apologetic whether justifiably or not. We have gobbled up these fallen scraps of recognition from the table of American narratives, pleased that our inoffensiveness was practised so doggedly that someone else pronounced it a cultural trait. This vision of Canada should disgust every patriot with warm blood in his veins. There is an illness of smug self-denigration which is endemic across the provinces and territories, and it needs to be discarded in favour of something nobler. At heart, celebrating our “apologetic” or “self-denying” character is not an appreciation of that propensity, but demonstrative of the anxiety that, without such a trait to cling to, there is no unifying culture to be found here. The uncertainty of Canadian national identity is not news for anyone, but insisting on this trope of perpetual acquiescence to the other is not a stand-in which is prudent or even admirable, it is only a positive spin on what is fundamentally a cultural taboo against assertiveness. Perhaps a frozen country dotted with a few warm hearths teaches the value of coming together in agreement despite our differences. Perhaps a side affect of this initial good intention is that much is left unsaid that may incite disquiet between neighbours. A few hundred years of that habit may even explain how we ended up with a culture which views mute pathological tolerance as a marker of moral superiority. The whole of European civilization is caught up in the nihilism of postmodern moralism but, sadly, Canadians seem farther along the road to becoming a country of invertebrates. Our deference to harmony aside, a large part of this situation is also owing to an enduring fiction which we are always at great pains to meme into reality: Canada the civic nation state. Canada, where there is never any reason not to be nice. Such a fairy tale is only sustainable in a world where nothing of importance is ever at stake. Small wonder that Justin Trudeau could so easily steamroll over a nation lauding its door-matt-ism as he named Canada the world’s first “post-national state.” Trudeau knew the only significant push-back would come from those civic nationalist reflexes which have been drilled into us by rote since the middle of the last century, and these would hardly give a globalist establishment pause. What is civic nationalism but a condition of acquiescence? 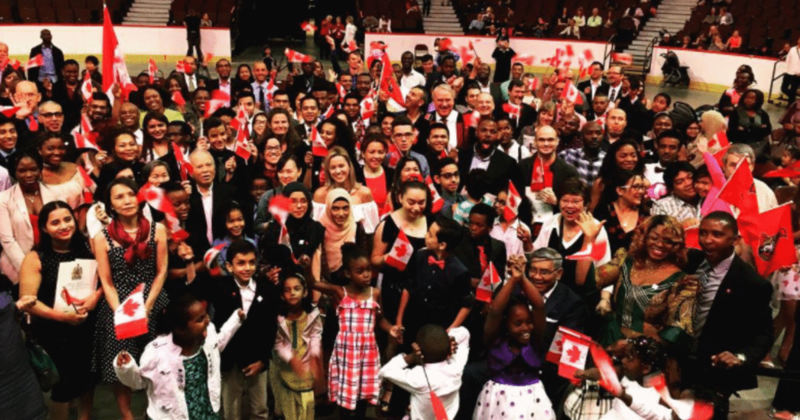 What is civic nationalism if not the seeds of transnationalism as are now being reaped by the likes of Trudeau? A nation which values politeness is not the same as a nation which apologizes for existing. Somewhere along the way, we confused the two. 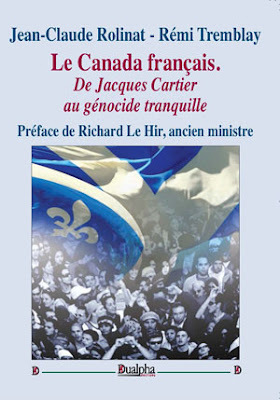 The cruel irony of this sad vision of Canada is that those who lay down before the wash of ethnic annihilation are convinced they are the embodiment of their nation’s identity while they are, in truth, only those who did not stand on guard for thee, O Canada. I count my younger self among this sorry lot. Perhaps I am looking for penance. Perhaps many of us here are. The effort to reject Trudeau’s post-national message is further complicated by the fact that we have never fit comfortably into the nation state model. Setting back the clock to a time of stalwart nationalism appears like an effective bulwark against globalism for some countries, but Canada immediately runs into the old separatist fault lines. The European nature of Canada before the recent deluge of multiculturalism is a proven reality, and yet the collection of European nations represented within our borders remains diverse enough that petty nationalisms fail to yield a united front for Canada to deploy against globalist aggression. Insistence on the dominant English nature of Canada, despite its strength, is not a collective way forward. Although there is clear value in the continuity of both English and French languages, cultures and institutions, such a focus is shortsighted and not unifying. The Anglophone/Francophone tension will be the wedge issue used to thwart any fledgling anti-globalist success in this country if we do not begin to circumvent it from the beginning. The burgeoning strength of the dissident right is healing a detachment so many of us feel from ancestral identity, which is both healthy and long overdue, yet there is presently a danger of pouring vitality into narrow ethno-political expressions. For every “God save the Queen” uttered in Canada, there is a globalist establishment which will showcase, not only a sea of alienated brown people, but perhaps more effectively, other European particularities which complicate coherent nationalist impetus and momentum. We might also begin to hear a din of “Vive le Québec libre!” or some mention of the dead on Culloden’s field, or perhaps of the wind that shakes the barley. On the surface, these sentiments are understandable and even justified, but within the scope of our current fight the time for these is not appropriate. Civic nationalism is the primer for globalism and yet simple nationalism proves fragile. What is required, is a unifying political umbrella capable of representing our ethnic distinctions with dignity and unity. The postmodern left is fond of describing “whiteness” as the source of all ills and, indeed, it is white faces which are destined to disappear from history in the name of Progress. In view of such extremism, the spectre of Identitarianism haunts all European peoples as it never has, and invites us to a new vision of collaboration. The search for a European universalism invokes Christendom or the Imperium Romanum or, if we go even deeper, the bedrock of Indo-European foundations. Genetics show, just as linguists anticipated, that Europeans are closely related peoples. We can easily conceive of ourselves as a greater family of ethnic distinctions branching from one tree. Pan-Europeanism is therefore the most nourishing soil to feed our roots. Whether an individual branch blooms with the English rose, fleur de lys, thistle or shamrock, any such blossom is but one hue in the greater autumnal crown of Europe’s foliage. And so what is the role of Canada? Some time ago, intellectuals fondly spoke of multiculturalism as our grand experiment. As a country led so far down the path of globalism, our role is to report the findings of that experiment to the world. 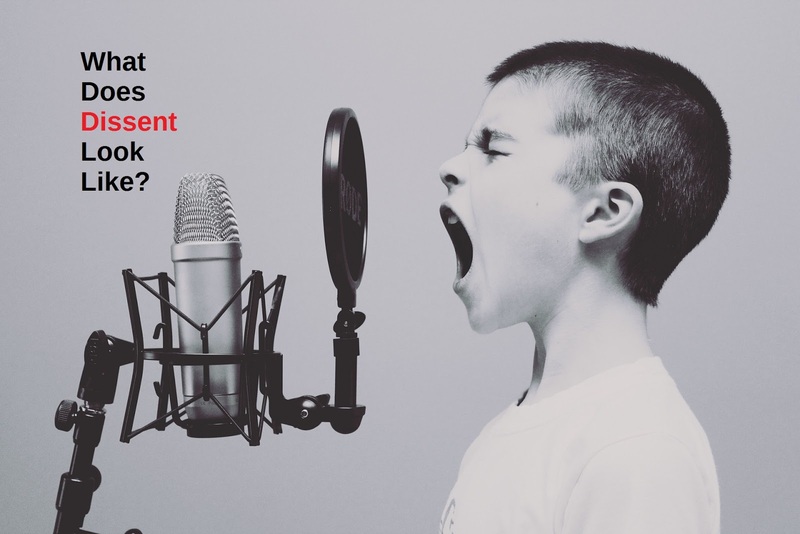 In a word, our role is rage. Rage at being shut out of our own future. Rage at being disinherited, deceived, dispossessed and dismissed. Rage at being made apologists for our very existence. And yes, as Canadians, why not let our role be that of a very polite rage? Our recent history holds lessons in dissent. 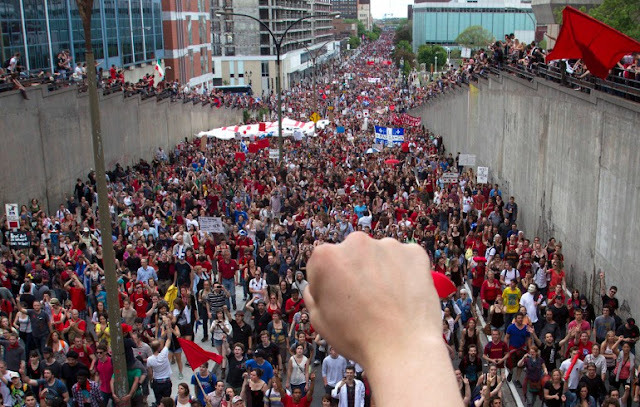 Some of you may remember the Quebec student movement, back in 2012, which grew as a response to the tuition hikes and general austerity measures implemented by the provincial Liberals under Jean Charest. The symbol for that movement, the carré rouge, could be found everywhere at that time. It was a simple patch of red felt, worn on the body to signify student debt and opposition to government austerity. The red square turned up in classrooms, at dinner parties, on stage, in banks and in grocery stores, such that politics quickly infiltrated all aspects of life. The real power of the carré rouge was its simple efficiency. From across the street, strangers could identify themselves as politically aligned without speaking a word. Social dynamics shifted. Alliances broke and formed along new lines. The sheer volume of individuals sporting the emblem in their day-to-day lives bolstered popular confidence and intensified proliferation. The symbol was so successful that I have heard reports of travellers now encountering it from Madagascar, to Ecuador, to Australia. This is what we need in order to bring our conversation into the daylight. A symbol—or, put another way, an efficient medium of dissent beyond digital anonymity, beyond cautious whispers, and beyond the deplatforming, which is coming for all those who would oppose the globalist agenda. We require an emblem which calls for a dialogue on the displacement of people of European ancestry. It must stand for our impending demographic catastrophe and our refusal to be silent. 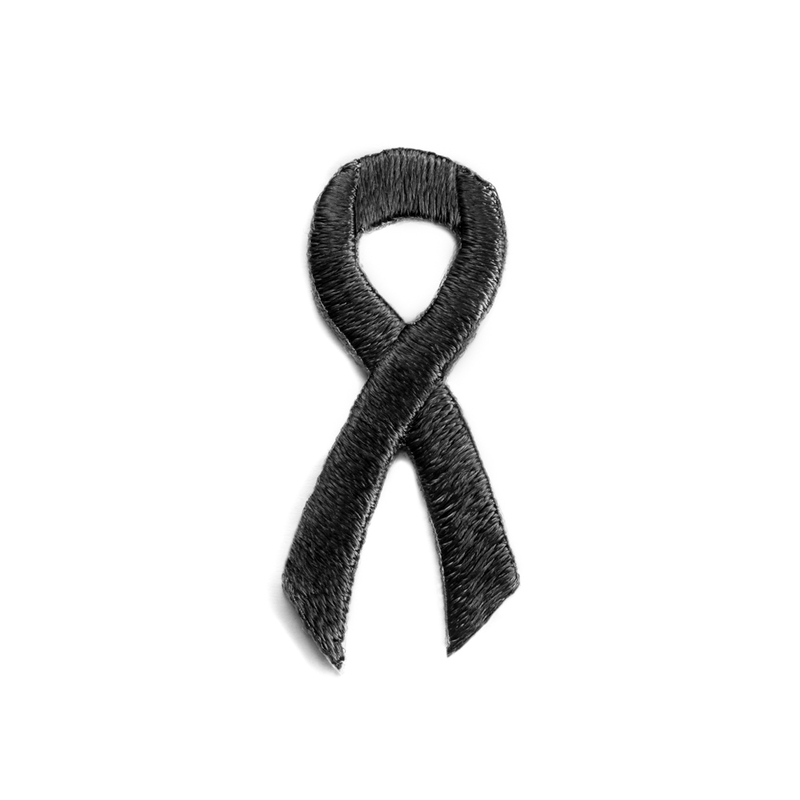 The black awareness ribbon, which is a symbol of mourning, is ideal for that purpose. And why not a more optimistic theme to battle anti-white rhetoric and policy? There are two reasons. Firstly, using the tone appropriate to tragedy or mourning to seek dialogue about our fate will convey to reasonable people that we are not undertaking a project of aggression. To direct public attention with a ribbon requires no oath of allegiance to “extreme” political affiliations which frighten normies. An avenue to the question of demography which bypasses political ideology as much as possible is in our interest. European survival must be a metapolitical issue – that is, a discussion that can be had by as many Europeans as possible without the implication that they are necessarily betraying any political leanings which they already hold, or engaging in behaviour which is easily painted as combative by the media. Ideally, the ribbon could be worn by libertarians, socialists, monarchists, liberals or individuals of any other political persuasion. However they come to reconcile their beliefs with our demographic emergency will remain to be seen, but demography is undoubtedly implicated in red-pilling, and common struggles in forging broader social cohesion. Secondly, any people so adverse to conflict as Canadians must be shown that all reasonable options have been exhausted before they allow their anger to realize itself. We must extinguish the illusion that there is a sane conversation about demography still waiting to be had somewhere in the political ether. Our call for national dialogue will be rejected or ignored by government and legacy media. It will be ripped apart and derided by the usual suspects in the virtue-swilling camp of social justice. Their refusal to acknowledge our deep concern is part of our message. The brilliance of the “It’s Okay to be White” phenomenon showed the effectiveness of triggering leftist vitriol by making reasonable and innocuous statements about white identity, as well as the benefit of enlisting an unwitting corporate media apparatus to expose the absurdity of their reaction. Justin Trudeau warned on a recent trip to the Maritimes that fear-mongering over immigration would likely be part of the next federal election. This comes in the wake of the UN Global Compact on Migration which aims to normalize and increase global mass migration and criminalize dissent. This appeal to reason and thoughtful engagement is the open door through which to politely lob the issue of European ethnocide. We would like nothing more than to have this national discussion free of “misinformation” and media gas lighting. If globalists like Trudeau are going to pursue our eradication, it is up to us to make clear that they can no longer do so with the pretence of other aims. They must attack us outright. Ribbons cannot be regulated. Ribbons can go anywhere people go. Ribbons can show us to ourselves, as we really are, in our daily lives. They can alleviate our dependence on the digital realm and breach the information bubbles of our neighbours and relatives. Like red squares or yellow vests, a chosen symbol can rally people to a common cause. In this instance, the cause is exposing the globalist establishment for what it is, and paving the way for a greater, pan-European moment. I implore you all, let it begin in our True North, and let it be an example that our people around the world may follow.